Bucolic Bushwick: Ugh Too Hot! FRAK, it's hot outside! These photos are a couple of days old because on 90+ degree days I don't step out on the roof until it's too dark to take pics. At this time of year I usually water the plants every 3 or 4 days, but due to the recent crazy temps I've been watering everyday. I could probably get away with watering every other day, but I want to play it safe. If a plant runs out of water it becomes extremely stressed and the more stress a plant is under the more vulnerable it is to disease and pests. Obviously I'm hoping to avoid this situation. 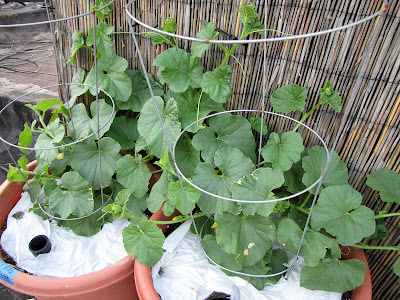 Both melon plants are now climbing the reed fence. I'm going to try to hand pollinate some flowers soon. I've never done this before so if anyone has any advice I'd appreciate it. 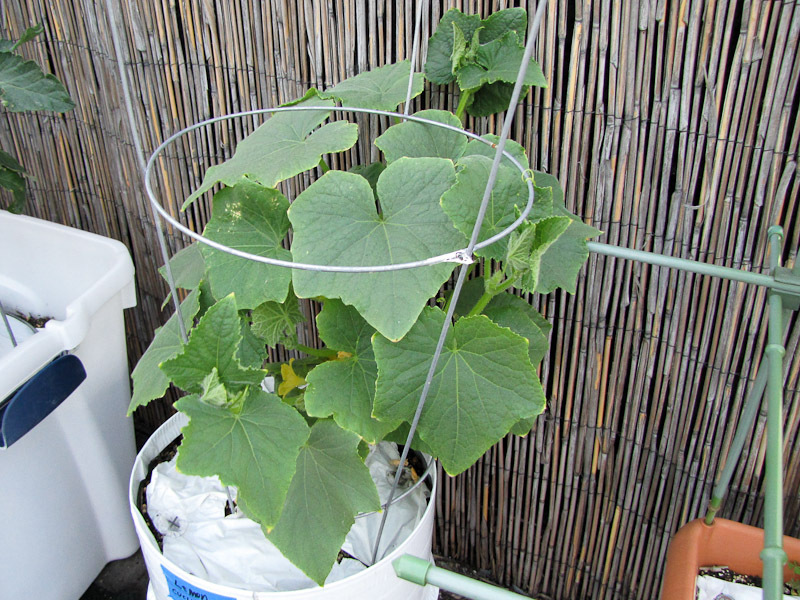 The Lemon cucumber has also started to climb its fence. The Sungold cherry tomato plant (in the white 20 gallon tote) was suffering from some serious windburn near the stairwell, so I made some room for it closer to some other plants. I thought the plant was doing fine near the stairwell until one day I went up and found one side of the plant had completely dried up. The leaves were still green, but utterly dry, crispy like potato chips. I moved it as soon as I noticed the damage. 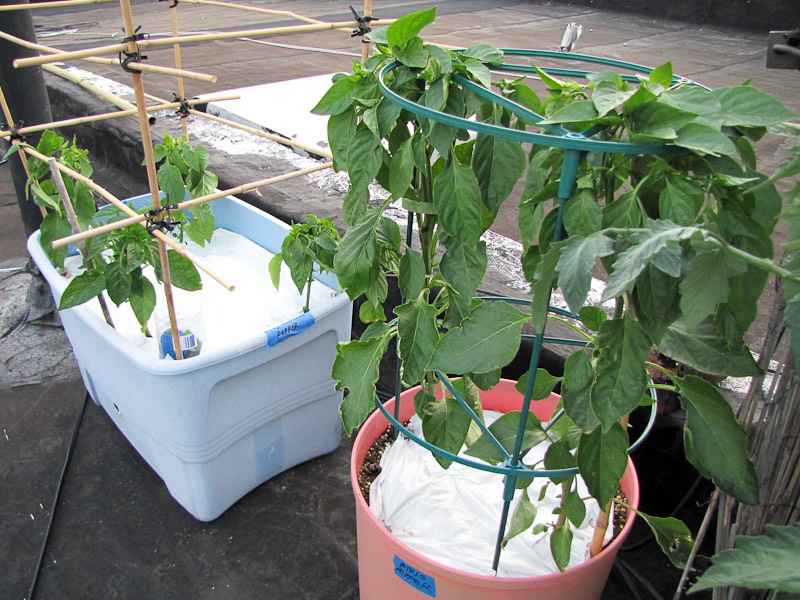 The 2 peppers plants in the Southern Patio container are doing well. New growth is much sturdier against the wind. The leaf shredding will never completely stop, but it's never as bad as the first few weeks they're out on the roof. The smaller pepper plants in the 18 gallon tote still look quite raggedy. It takes about 3 weeks for pepper plants to adjust to the windy environment. These plants need about a week more to acclimate. 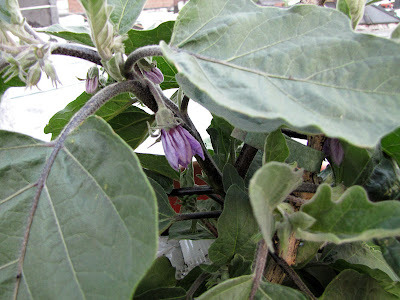 The eggplants have finally flowered, so now everything in the garden has bloomed. How's your garden doing? Do you feel like you're ahead or behind schedule as compared to last year? My smaller pepper plants are a little behind, but everything else is equal to or ahead of last year's garden. 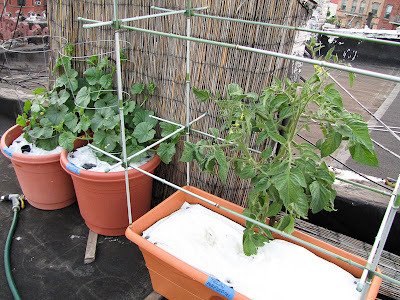 I feel ahead of last year by a mile -- my tomatoes are growing like weeds (probably because of the heat) and I even have a huge bell pepper plant that has managed to put on a 2 inch long pepper! 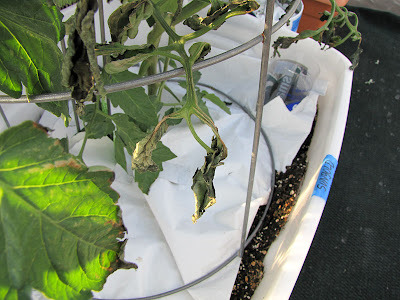 My only concern right now is my eggplant which looks healthy enough but hasn't grown much at all in the last 2 weeks -- any idea what might cause that and if I should be concerned? Hi Brianna, when you did you plant the eggplant? If you planted it recently it could just be focusing on growing its roots instead of leaves. I'm jealous of your pepper, mine are weeks away from producing. 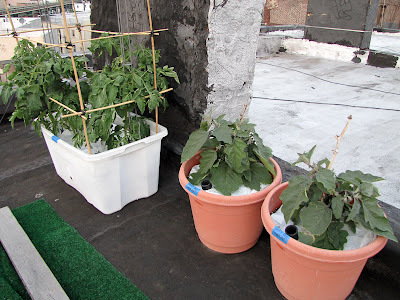 When it is very hot on my roof I drape shade cloth over my tomatoes and cucumbers plants. 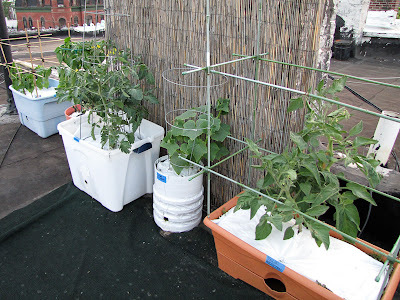 You can cut the shade cloth to fit around your containers. It works and I have used this technique for two years now. I first saw its use when traveling through South East Asia. It is insanely hot here too. The roof particularly seems to get hotter due to direct sunlight. I see now the need for serious mulching. I think my watering hose shrunk a little because of the heat! 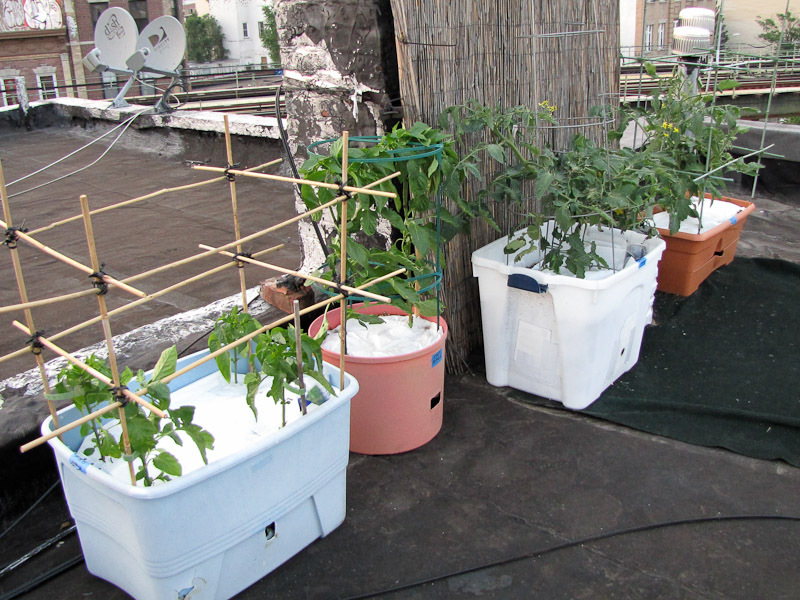 Hi Elaine, looks like things are going well on your roof in spite of the wind-burned tomato and the pepper plants getting adjusted! Lots of growth and flowers - awesome! My pepper plants haven't grown all that much but they've produced a few flowers already...not sure if the containers are just too small or what. I have two cucumbers and they are doing well but I fear they are starting to get shaded out by the lush growth of the yellow pear tomato plant that they are planted on either side of. My tomatoes, however have taken OFF and are big and strong and tall and gorgeous. 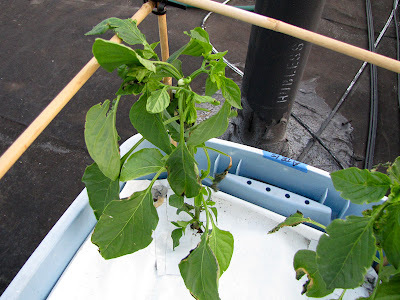 The sun gold cherry tomato seedling that you gave me is doing VERY well, and is the first of all my tomatoes to bloom - several flowers already, and it looks quite happy in its 5-gallon bucket home. Thanks! @Johanne, thanks for the tip! I could definitely use more shade on the roof. @Charm, it gets crazy hot on a roof, I would definitely recommend mulch. Go for plastic, anything else will dry out much faster. @Red, great to hear about your progress. Hope your cukes don't get shaded out, maybe their vines will find the sun. I can't wait for the Sungold cherries to fruit!